← 2012 in review; much more to come to SlowBirding in 2013! Walk the same route over and over so you can get to know the common birds for that place and notice the rarer ones. Here is a walk I took for three weeks while working at the Kavli Institute for Theoretical Physics. Out the door onto the mowed grass of West Cottages, UCSB housing, where the California towhees scratched, hopped back, peered down, showing their russet rumps, then repeated. A dull western bluebird perched on the wall, its mate nearby in an oak. White-crowned sparrows stayed closer to the bushes as they foraged in the grass. One caught a cricket and swallowed it, head first, spiny cricket legs sticking out last. Out on the road, I looked down to the lagoon where the great white egrets and black-crowned night herons lurked. Out in the high tide lagoon were Western grebes, buffleheads, ruddy ducks, and mallards. But I did not turn that way. I turned towards the beach. I imagined students crafted the signs telling of vernal pools and coastal scrub here at Coal Oil Point biological station. I took the narrow path that hugged the wooden fence keeping us up on the cliff and out of the dunes. A rabbit dashed across the path, improbably small in the scrub. 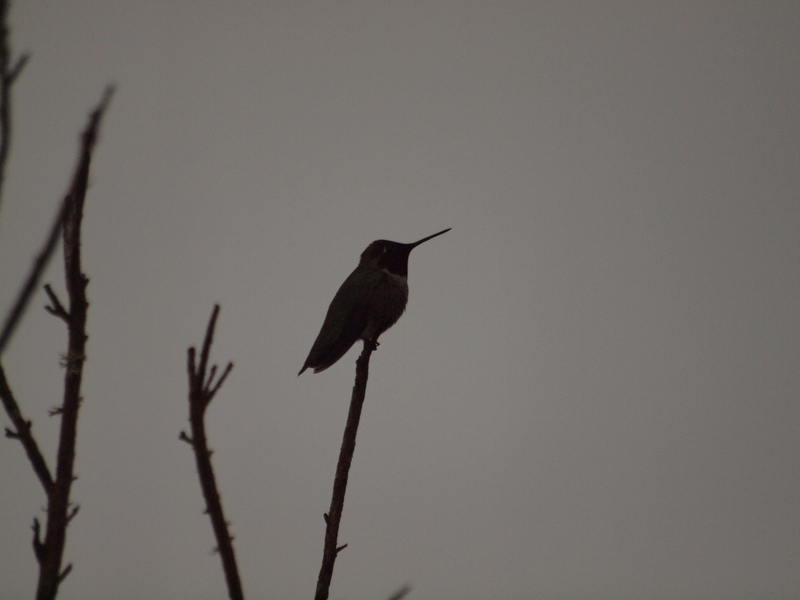 An Anna’s hummingbird male perched squeaking high on an agave stalk. A black phoebe dipped its tail, then flew off its perch and out over the dry meadow. No researchers occupied the labs of Coal Oil Point early this Sunday morning, but a yellowthroat darted into the lusher bushes along the building. A song sparrow sang a buzzy variant of the song I know so well from Michigan. A surfer parked his bike and walked down the bluff into the waves, already wearing his wetsuit. I went down the rough path carved into the bluff up to the rising high tide. Pacific and California gulls flew off the point. 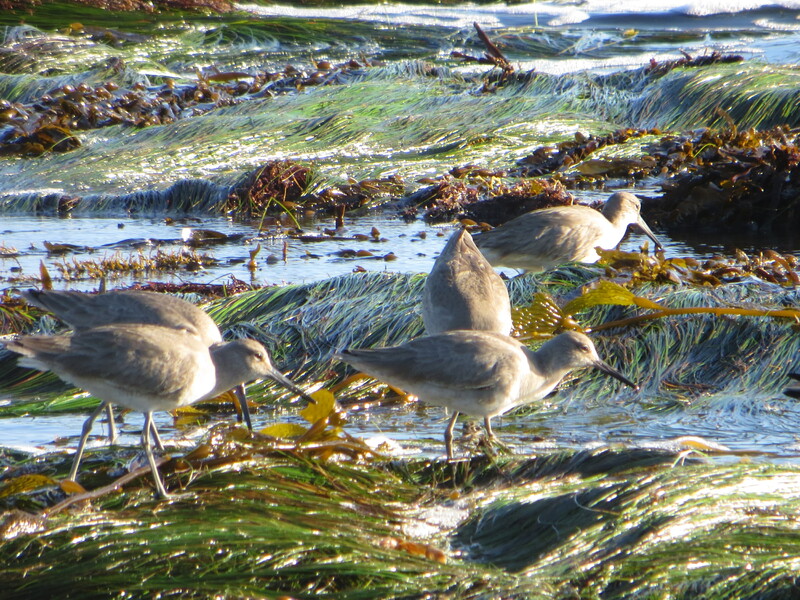 A group of willets pondered the surf. 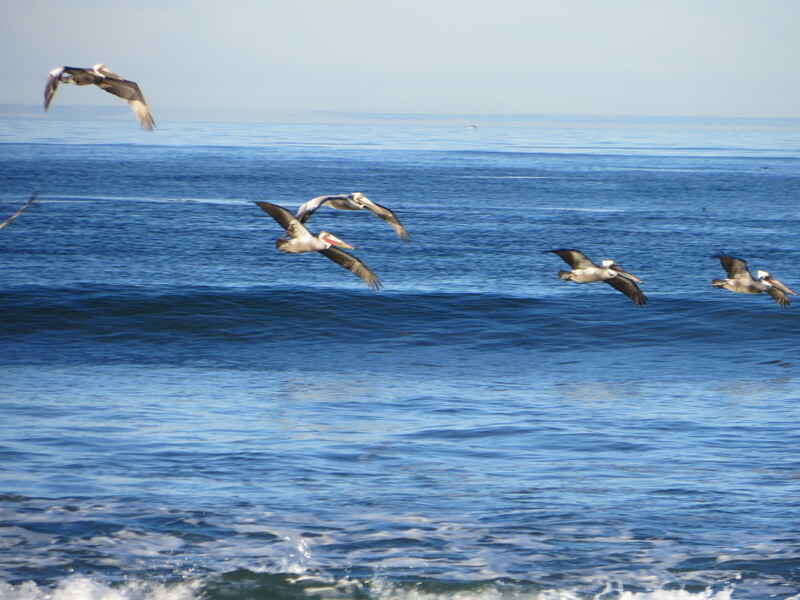 Three pelicans flew past, a constant reminder that we almost lost them to pesticides. 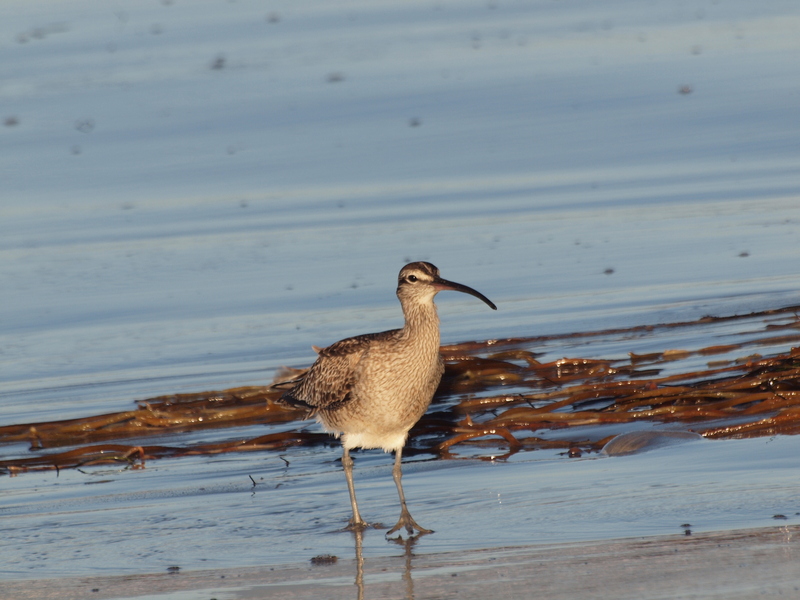 A lone wimbrel walked across the dunes. 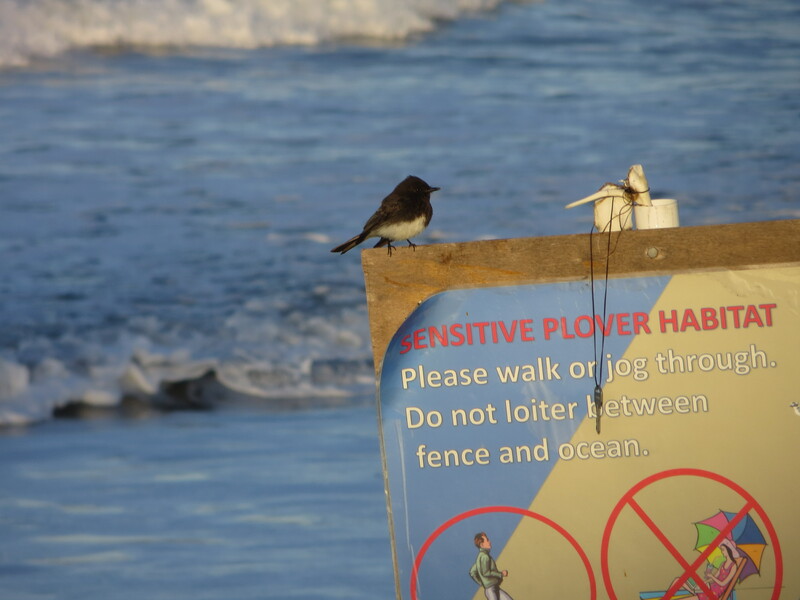 There were no sanderlings in this high tide. 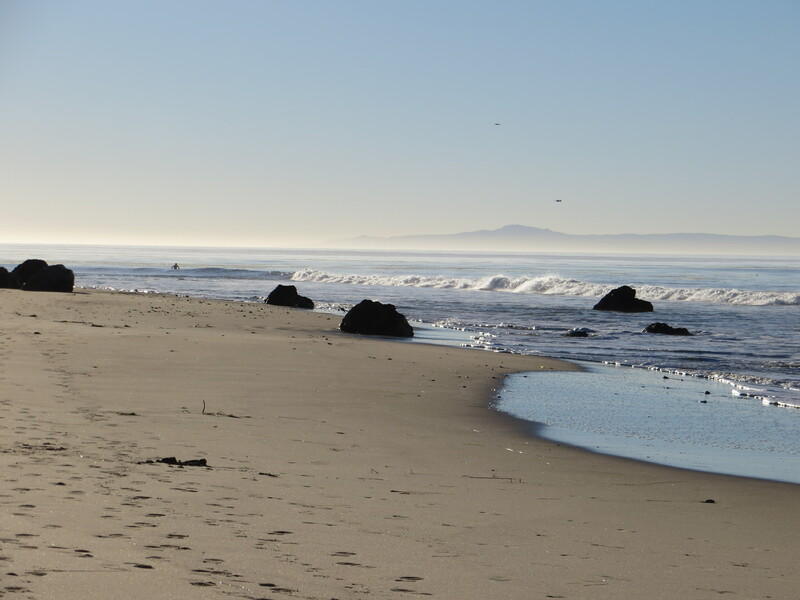 I walked on down the beach towards the outlet of the lagoon. There I saw them, nestled like rocks in the clumpy dunes. 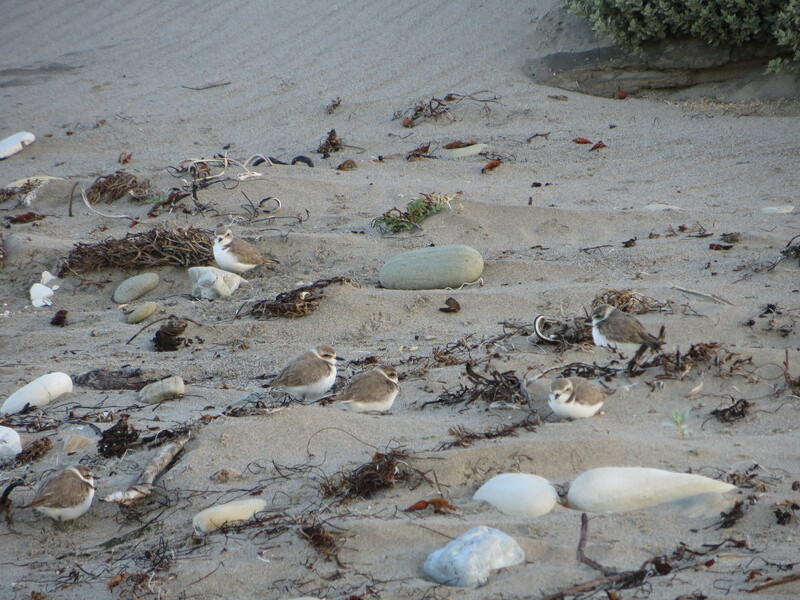 Snowy plovers fluffed themselves out as they waited for the tide to recede. I took their photo and turned around, not continuing to the monarch wintering grounds, for the lagoon was filling. The slough was open. My run would have to be on the bluff-top trail, so I went back up, causing 3 California quail to dash across the path. I ran a modest mile, stopping for the view at the point and the high tide waves crashing across the rocks. I had finished listening to Lonesome Dove and had moved on to Streets of Laredo. 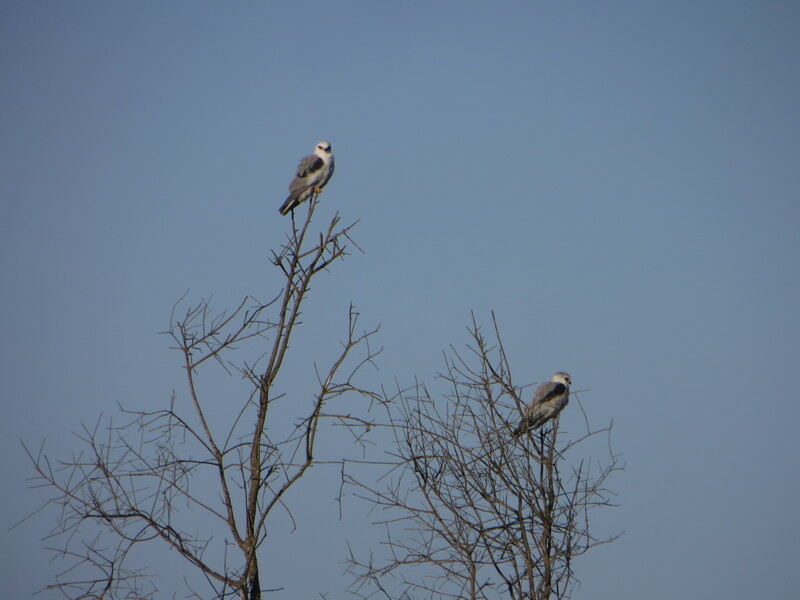 On my run’s return, I saw two white-tailed kites perched in a dead snag high over the coastal scrub. 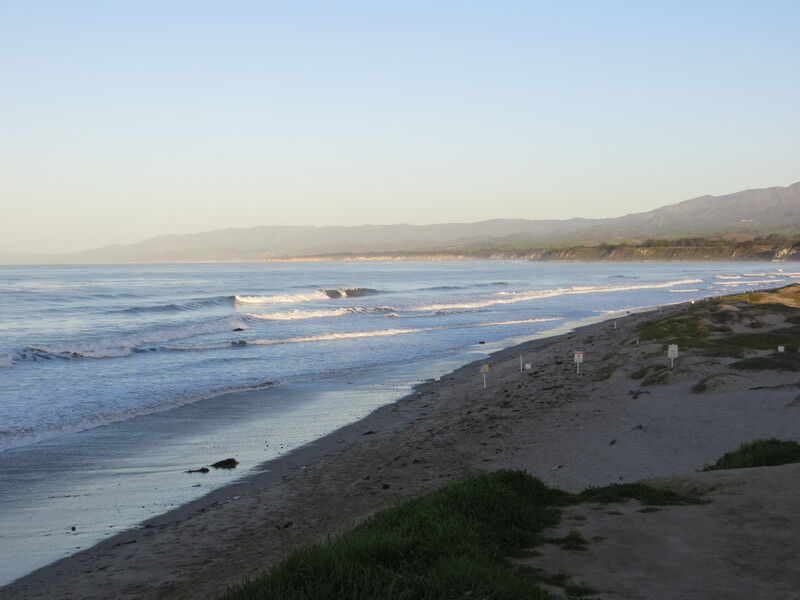 There is no end because there is no beginning, just the tide peaking and withdrawing, the foam blowing and subsiding, the surfers paddling, then riding, and the never-finished shorebird hunt for food in the wet sand. 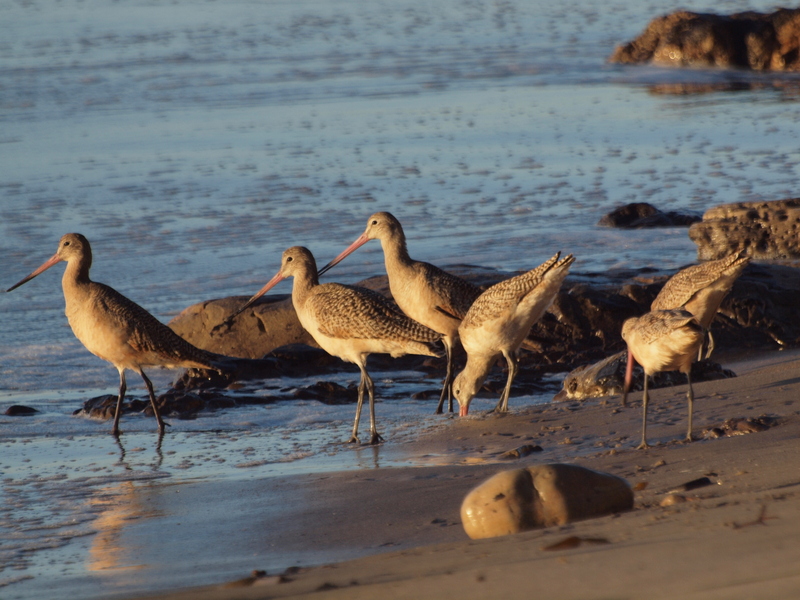 This entry was posted in Birds, Natural areas, Shorebirds and tagged California, Coal Oil Point, Coal Oil Point seep field, Santa Barbara Channel, Tide, University of California Santa Barbara. Bookmark the permalink.